Wio Tracker (Wireless Input Output) is an open source gateway which enables faster IoT GPS solutions. It is Arduino and Grove compatible development boards that helps you track nearly any moving thing on the planet and then upload that data wirelessly. The Wio LTE is the LTE version of Wio Tracker, so now we’ve got 2 versions of Wio Tracker and the LTE (4G) version will make some differences. There are three main updates comparing the Wio LTE to the 2G version. Firstly, from its name we know that the Wio LTE supports LTE (4G) communication which is much faster and popular than 2G. Secondly, the Wio LTE supports in total 4 different GNSS – GPS, Beidou, GLONSS and Galileo, the QZSS is also supported as bonus. With more GNSS support, positioning will be more accurate. Thirdly, the Wio LTE‘s MCU is upgraded to STM32, which is based on Cortex-M4, makes the Wio LTE 5 times faster than the 2G version. What’s more, the flash and RAM have also been raised to 1Mbytes and 192+4k bytes. Apart from the three main updates, the LTE version is almost the same as the 2G version. 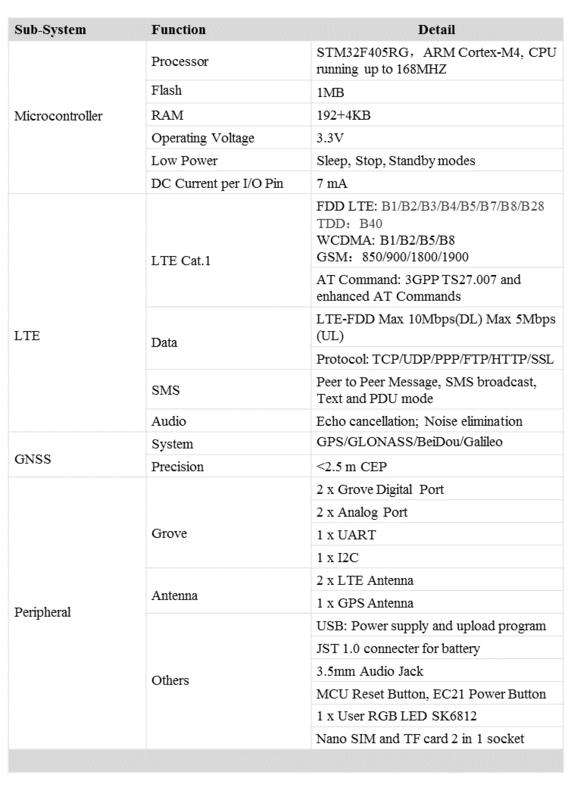 If your project is using the 2G version, it would be very easy to update to the LTE version because we have prepared transplantable and expansible AT command library. The Arduino and Grove compatibility allows for quicker development through numerous libraries and a supportive community. The GPS library which will be available with the board is not just limited to Arduino – it can function just as well if you chose to develop in C/C++. With the onboard 6 Grove connections, developers can create any combination of our 180+ sensors and actuators to build project and solve any problem. Simplifying the prototyping and development phase is our goal. The Wio LTE is well suited for outdoor projects where the device can connect to the GPS satellites and provide a real-time location of the item it is attached to. The LTE provides a wide bandwidth which allows much faster interaction between the user and device. If you are going to build projects like a bicycle sharing service, tracking pets or livestock, locating a vehicle, or even keeping track of a child, the Wio LTE is the best solution. The suggested power supply for Wio LTE products is 5V/2A; The board may not be able to power up when the current is below 1A. Please always plug a 3.7V Lipo battery in case USB power supply is not sufficient. When the signal is not good, there will be noise while calling. We have developed 4 different versions of Wio LTE for different regions. This is the Wio LTE AU version, except this version, the others also support GNSS, below table shows the difference between each version. For more detail information, please refer to the manual. B2 band on EC21-AU module does not support Rx-diversity.